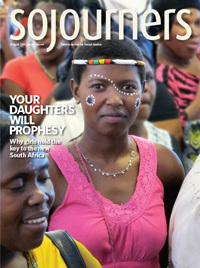 Kimberly Burge is a Sojourners contributing writer and author of The Born Frees: Writing with the Girls of Gugulethu, about girls growing up in post-apartheid South Africa. FOR A GOOD SIX MONTHS, I didn’t notice the words carved above the grand sanctuary entrance to Mount Vernon Place United Methodist Church in Washington, D.C. The letters stand guard over the doors like sentries: Methodist Episcopal Church, South. The words meant nothing to me. In February, the General Conference of the UMC voted to strengthen the enforcement of denomination rules against ordaining LGBTQ Christians and performing marriage ceremonies for LGBTQ couples. But Mount Vernon Place (MVP) has long described itself as “young and old, gay and straight, liberal and conservative, housed and unhoused, people filled with faith and people who know doubt.” It struck me as a place I could fit in and be challenged. On my first visit, I was intrigued by a bulletin notice announcing the launch of a racial-justice book group—especially since the congregation is predominantly white. So I joined. Book group leader Caroline Anderson-Gray, white and in her 30s, has been a member at MVP for four years. I asked her why she started MVP’s racial justice conversation with a book group. A book group may not seem like much given the rise of social terror. But small discipleship groups are a very Methodist practice—and this one opened a space for transformative conversations. Eight to 12 people, a microcosm of the church, gathered every other month to read and learn. One man, a Canadian expatriate, spoke about his difficulty in understanding his new country considering the experiences of his African-American husband. Una Song, an MVP member for three years, said that reading Patricia Raybon’s My First White Friend helped Song clarify her own experiences of exclusion in a country dominated by white privilege. Flags are only symbols, of course. Chucking one for another does not automatically overhaul a society’s deeply entrenched structural oppression. Lowering a flag and relegating it, belatedly, to a museum does not change people’s hearts and minds. Under South Africa’s new flag, the Born Frees are inheriting a country awash in contradiction. How free can this generation be with one of the highest levels of income inequality in the world? With the rampant violence that especially plagues black townships and is frequently directed against women and girls? With the remnants of a broken school system that was not designed to educate all its citizens equally? How a punk-rock drummer came to love ancient Syrian spiritual music. Gail Taylor hopes that Three Part Harmony Farm in D.C. Brookland neighborhood becomes the city's first commercial farm since the 1930s. There are many reasons to abolish the death penalty. Innocents on death row may be the most compelling. The lost art of reading might be in danger, but I'm happy to report that the desire to write remains strong, at least with Amazw'Entombi ("Voices of the Girls"). This creative writing club in Gugulethu, a township 10 miles outside Cape Town, South Africa, drew together nearly two dozen expressive girls, ages 13 through 20, each week for a year. With the help of a prompt -- a phrase or a short piece of writing to get started -- together the girls and I wrote. Like athletes in training, we built up from an initial three minutes of writing to, eventually, 20 minutes and sometimes longer when they asked for more time. Then we would go around the circle where we sat and read aloud what each of us wrote. One week, the girls collectively wrote their manifesto (below), and staged a reading when the Flip camera came out. Then Sharon added her own contribution, "Proudly South African" (to hear her read, click here). She's now enrolled in her first year studying psychology at the University of Cape Town. I'm secretly hoping she switches to journalism. In the new South Africa, the future is speaking in the voices of the girls. Uwem Akpan, a Jesuit from Nigeria, tells stories about Africa through its children, creating rich and complex characters that capture the heartbreaking realities of growing up in the midst of war and poverty.